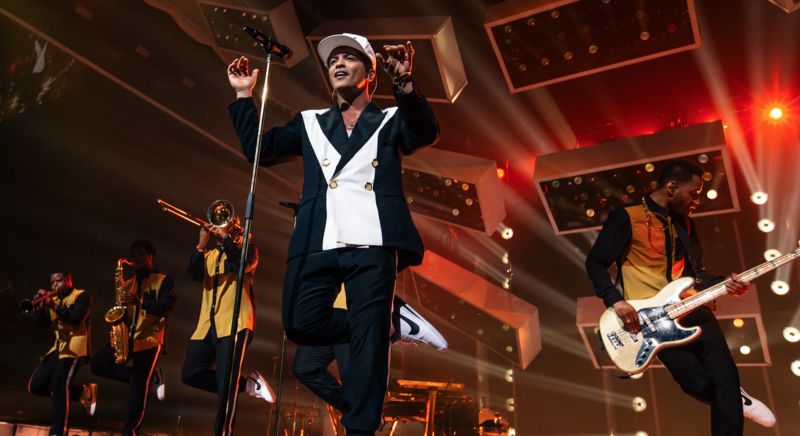 Bruno Mars recently finished a three-month European stint of his world tour. At the time of writing, we're in Paris, the tour is a week from completion, and front of house engineer, Chris Rabold, tells me the team has barely been able to catch a breath. “We’ve been all over Europe, and we still have another month to go, and then that’ll be the end... of this part,” Rabold smiles, adding that the US is next – and there will probably be a couple of one-off shows and TV performances in between. I last saw Rabold in Pittsburgh at a Kenny Chesney concert, where I watched him keep entirely calm as the front of house cage almost took off during a wild rain storm. Today, we’re indoors, of course, so nothing to fear on that front. I spy a Clair PA system, and ask him to break it down for me (not literally, that would be madness). Rabold has his SD7 pretty much maxed out – which he never deemed possible – which gives you an idea just how big this show is. He is also running Waves SoundGrid, using a handful of Waves EQ and FX plugins, and he has his trusted rack of outboard kit that he brings with him on every tour. His mic package is mainly Sennheiser for vocals, with some Shure, Telefunken, and Audio-Technica offerings, too. “I do love the good old AT-4050 on the guitar; it’s just one of my favourite live guitar microphones to use, as it sounds so great,” Rabold declares. 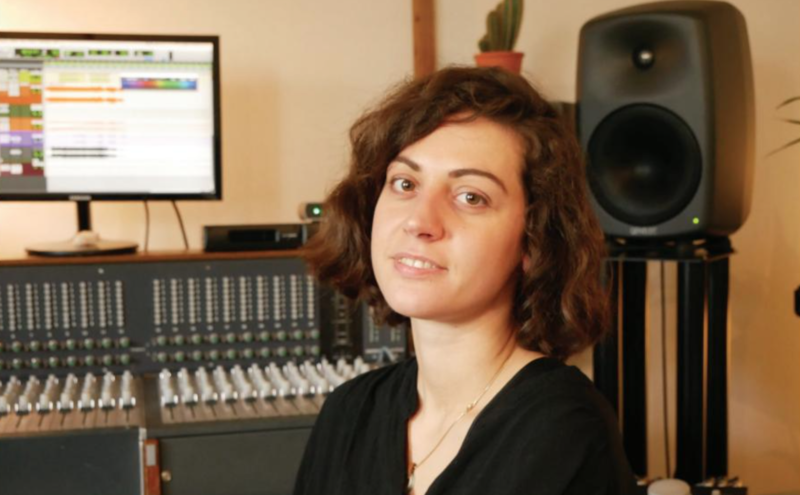 "The [DiGiCo] SD7 is so fast, and everything is right there." Ramon Morales is working monitors on the show, and he's also on an SD7. “We have Bruno on JH16s - it’s his personal preference. We tried him on Roxanne and JH16v2s, but we kept going back to the JH16; there is something about that piece that he really likes, and it’s working. I have my JH16s, too – it’s important I’m on the same as him – and the JH16v2s are what the rest of the band are on, and they’re fantastic. What JH Audio did was add a couple of high end drivers to where the JH16s were, I think... And I’m sure there is something else going on in there, too, that we obviously don’t know about! "We have Bruno on [JH Audio] JH16s - it's his personal preference." 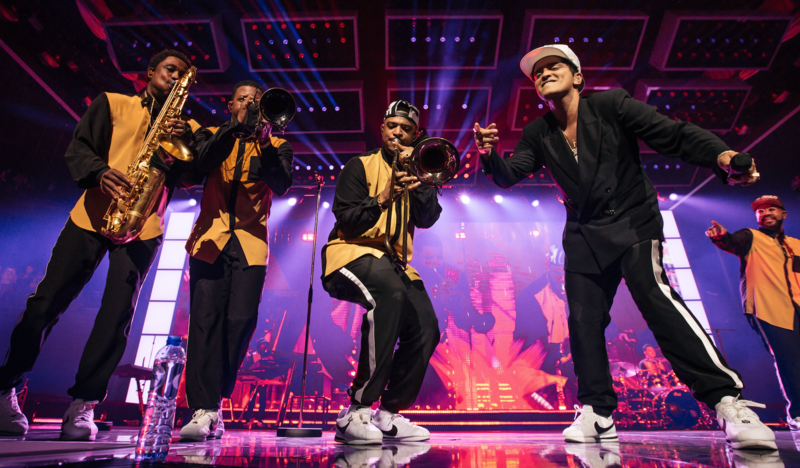 I head backstage to meet Joel Forman, Bruno’s production manager of some six years. On arrival, he tells me these two Paris shows are 39 and 40 of the European stint, and there’s still two weeks to go. Christ, that’s a lot of performances! “A successful tour as far as me, the production manager, comes down to this: we’re 11 weeks in, and most people still like each other; we have our moments, but we’re all good, and still willing to go for beer and supper with the guys next to us. That to me is a successful tour. "The whole floor package is GLP X4 Bar 20s, and they work fantastically well." For Fitzgerald, it’s not only the brightness and the tilt functionality that impress him about the fixture – it’s much more surgical than that. 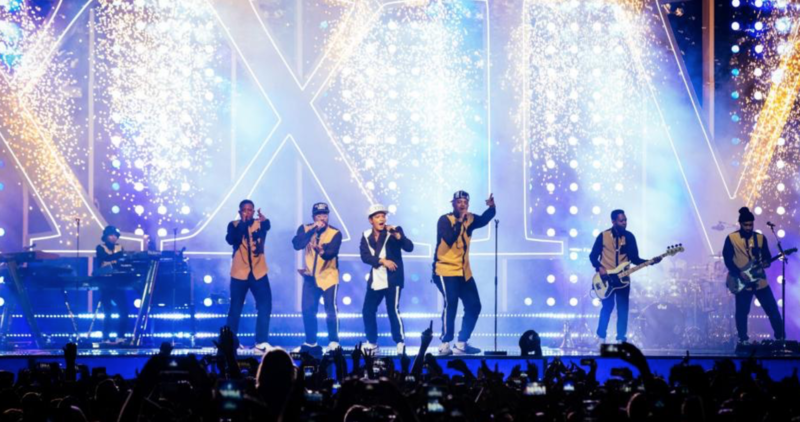 I knew that Bruno Mars shows had a reputation for always being great, but nothing prepared me for what I was about to witness. Never before have I seen such a well organised, structured show – incredibly well put together. And it sounded incredible; Rabold’s mix was bang on the money, as were the band, all of whom could really move as well as play, which was particularly entertaining. And the light show? Nothing short of epic. As Fitzgerald says, it’s all about getting the lighting to follow the music, and it truly provided another dimension. As I make my way to the exit, all I keep asking myself is, how does Bruno Mars manage to deliver a vocal performance like that, night in, night out? What a talent this guy is.